The U.S. division of an Israeli company that recently scored a U.S. EPA research agreement is run by President Trump's former longtime environmental adviser. Ed Russo, the former environmental consultant to the Trump Organization, is CEO of Watergen USA, the American division of Water-Gen, the Israeli air-to-water company. In an interview with E&E News today, he said he has been meeting with as many people as possible to tout the company's atmospheric water generator technology, which he believes can save lives where water runs short. 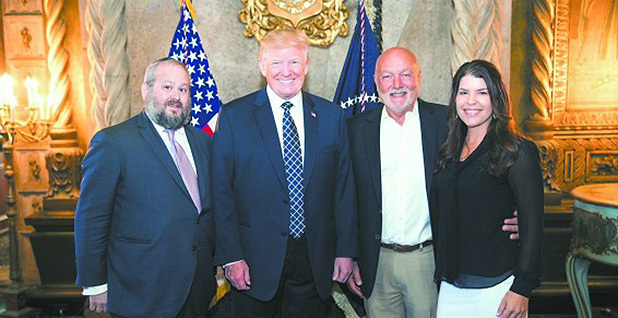 That included a stop last weekend at Mar-a-Lago, Trump's luxury resort in Palm Beach, Fla.
On Water-Gen's Facebook page, Russo and Yehuda Kaploun, president of Watergen USA, are pictured with the president. Russo said he was at the resort for a gala hosted by the International Fellowship of Christians and Jews and ran into Trump there. "It is just incredible stuff," Russo said about Water-Gen's technology. "I have been having continuous meetings with anyone who is interested in bringing clean, fresh drinking water where there is none." The company has high-profile supporters, including casino magnate and major Republican donor Sheldon Adelson. EPA Administrator Scott Pruitt's private calendar, obtained by E&E News under the Freedom of Information Act, shows that Adelson requested Pruitt meet with Water-Gen executives in March last year. The agency announced this week that it had signed a cooperative research and development agreement (CRADA) with the company (Greenwire, March 28). A CRADA, which are often signed between the agency and companies, universities or other outside groups, is used to conduct collaborative research. EPA can't send out funds under the agreement, but it does provide services like staff time and lab facilities. Russo said EPA is testing Water-Gen's atmospheric water generators to see if they can meet agency standards. "We want to be doubly sure that we put our machines through rigorous tests to be well within the federal clean water standards," Russo said. "Everything is going well." He noted that the company had helped authorities respond to hurricane season last year. As several people were left without water for days, Water-Gen provided and operated its machines free of charge in disaster areas in the path of Hurricanes Harvey and Irma. "That was a humanitarian effort. There was no cost to the American taxpayer with FEMA or the American Red Cross," Russo said. "It is just amazing how many gallons these things could produce." In November last year, Russo and other Water-Gen representatives met with EPA officials. "I went to EPA today to respond to their request that we have to reach certain standards. We have reached those standards, so now what do we do?" 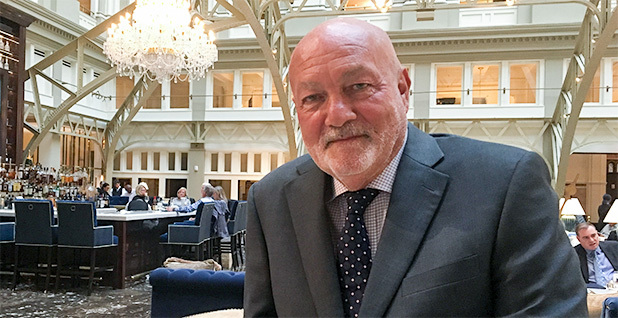 Russo told E&E News during an interview then in the Trump International Hotel after his meeting at EPA headquarters across the street. "When you do business with the government, it just drives you crazy, so now we're gearing up," he said. "The government has requested that we get ready to respond to the emergencies around the country. ... We're not there yet; we're not selling anybody yet." Russo said his team wasn't pushing for federal grants at the time. "No, we're strictly trying to understand the federal clean water standards, because the federal clean water standards are basically for water as a source, and then you filter the water. Making water out of air, there are no standards," he said. "So before we sell these machines to anybody, we'd like to know what the federal water standards are going to be." He added, "Somebody made water into wine at one point. That's been done. We're making air into water, which is pretty slick. It really is an amazing technology that most people are just amazed by — 'What do you mean, water out of air?'" He said that he had met with career EPA staffers, not with Pruitt or any other Trump administration political staffers. Russo had also been at EPA's research and development center in Cincinnati the previous week, he said. In his interview today with E&E News, Russo said Water-Gen is doing tests under its CRADA with EPA at that center. While he no longer works for the Trump Organization, Russo is still working on environmental issues and defending Trump's policies. Ahead of Trump's election, Russo wrote a book titled, "Donald J. Trump: An Environmental Hero." He said last November that he had been offered a job as senior adviser to the president on environmental and energy issues. "My wife wants me to go, but I keep on just kicking the can down the road," he said then, adding that he might accept the post eventually, "maybe 2018." "I think I'm having a better impact from the outside," he said. Russo said today, "I should have the right to go to save the planet on my own now, which is what I'm doing now."